Comments: On the forest moon of Endor the last great conflict of the Galactic Civil War is about to take place. The Empire has terrible weapons of war on its side, but can it prevail? Can the Rebels hold off the Empire and win the war? AT-ST: The All-Terrain Scout Transport adds speed and firepower to any Imperial assault. Scout Trooper: Lightly armored and extremely mobile, the scout trooper excels at reconnaissance and patrol. Stormtrooper: Imperial shock troops totally loyal to the Emperor, stormtroopers wear plastoid composite armor. 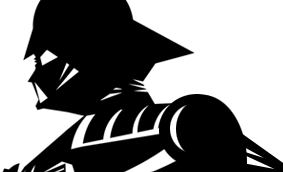 Stormtrooper Officer: This officer instills those under his command with discipline and complete loyalty to the Empire. 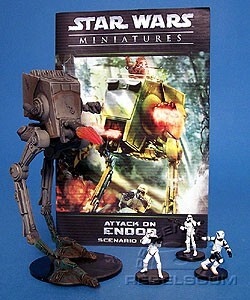 Attack on Endor is a multipack made up modified figures from the Star Wars Miniatures game. It includes 4 figures, 2 double-sided maps, and a new scenario book with updated rules and new missions to be used during gameplay. The AT-ST is repainted and reposed version of the AT-ST from the Universe series. A "blast effect" has also been added. The Scout Trooper is the same as the Scout Trooper figure from the Rebel Storm series, but with a new base. The card and box graphics show the Stormtrooper is a repack of Stormtrooper #36. However, the figure itself is actually a repack of Stormtrooper #38 figure from the Rebel Storm series, but with a new base. The stats are the same for all three. The Stormtrooper Officer is the same as the Stormtrooper Officer figure from the Rebel Storm series, but with a new base. The missions in the 32-page Scenario Book take place across all Star Wars eras, from the Rise of the Empire era to the New Jedi Order era, and are inspired by the many books and games that comprise the Expanded Universe. You'll need some specific miniatures available in the universe booster packs only, as well as a handful of miniatures found in Rebel Storm and Clone Strike booster packs.